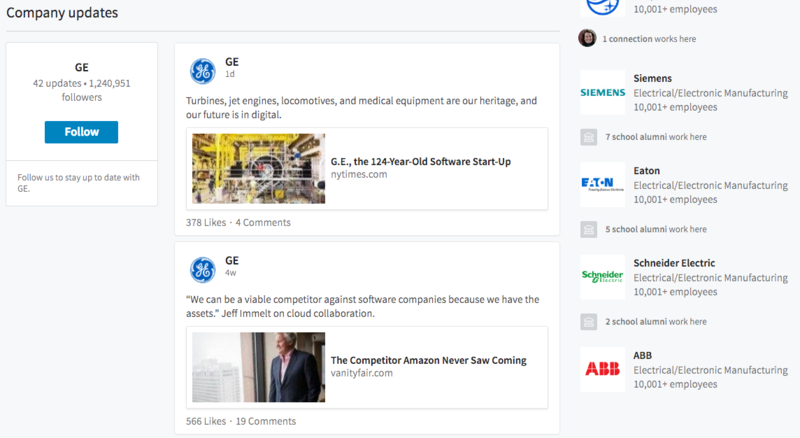 Looks like LinkedIn is revamping the layout for “company pages”–and it’s testing the concept with some of its biggest customers (GE and IBM are the two I’ve seen so far). Since I’ve seen no official news from LinkedIn or other media organizations so far, I can only assume this is a beta version (see the URL for proof) and that the new layout (with additional tweaks) will be rolled out to all other brands in the near future. Right at the top, you can see content is now allotted in three distinct buckets: Overview, Jobs and Life. A simple click on each produces additional content below. The design is much cleaner than the current design and (in my view) much easier for users to navigate. Net win for everyone. Click on the “Overview” tab and you’ll see a collection of information you most likely have on your current LinkedIn company page–about, recent updates, showcase pages and similar companies. The only new content here is “company photos”, which will give organizations a nice way to provide prospective employees a deeper look into the company. Win for companies. On the downside, company updates are relatively minimized with the new layout. Not only do you have to click on the “Overview” tab to see them, you have to scroll down a ways as well. Obviously, most people will see these updates in their newsfeeds, but this is probably a net loss on the company side. This section, again, seems cleaner and easier to navigate than the previous “Careers” tab. 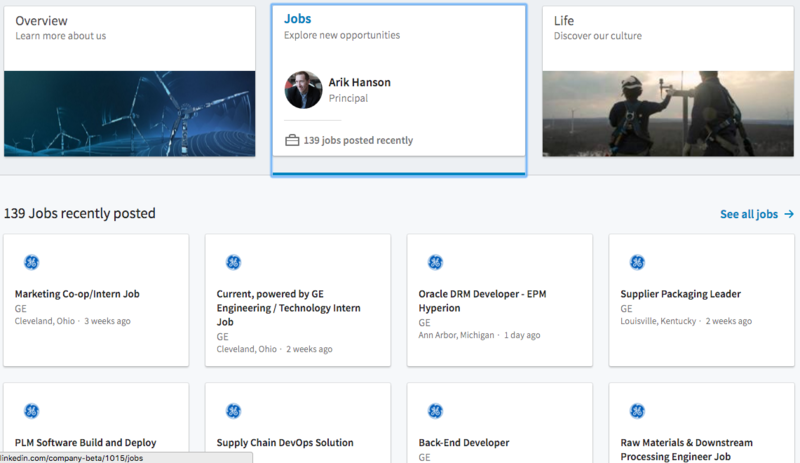 I’m sure some might see this as a “downgrade” since it appears there are more branding opportunities on the current Careers tab, but I tend to think simplicity rules and this makes it much easier for job seekers to get to the information they want faster. I also love sticking the “Employee insights” in this section. This is useful information for job seekers can use to make employment decisions. No additional work required here for brands, but I think this section is a big win for job seekers. What’s great about this completely new tab is that it aggregates all the information that would help you paint a picture of the company’s culture in one spot. 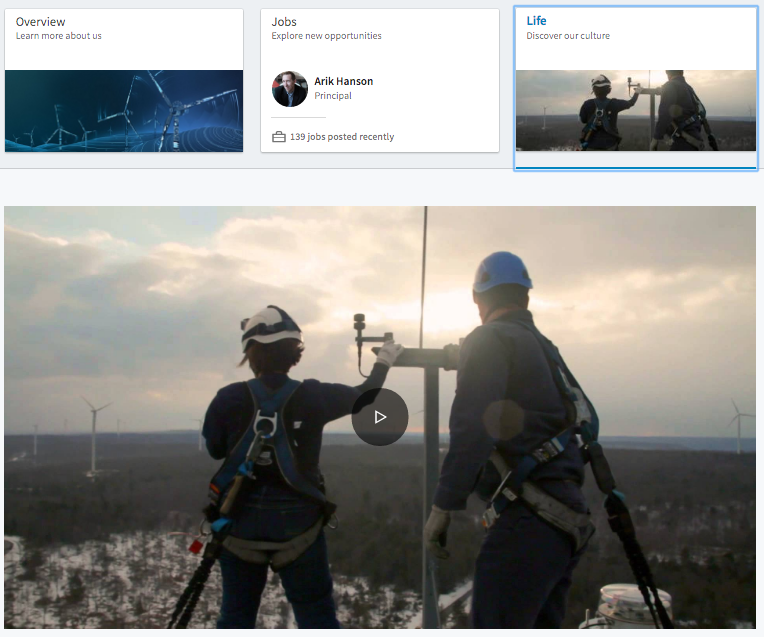 It looks like company’s have the opportunity to feature a video right at the top of the tab–which some companies have now, but it’s at the top of the “Careers” tab. But, right below is where things get REAL interesting–and useful, if you’re a job seeker (and an employer). I love how they highlight the leaders at GE right below the video. Now see THIS is key. 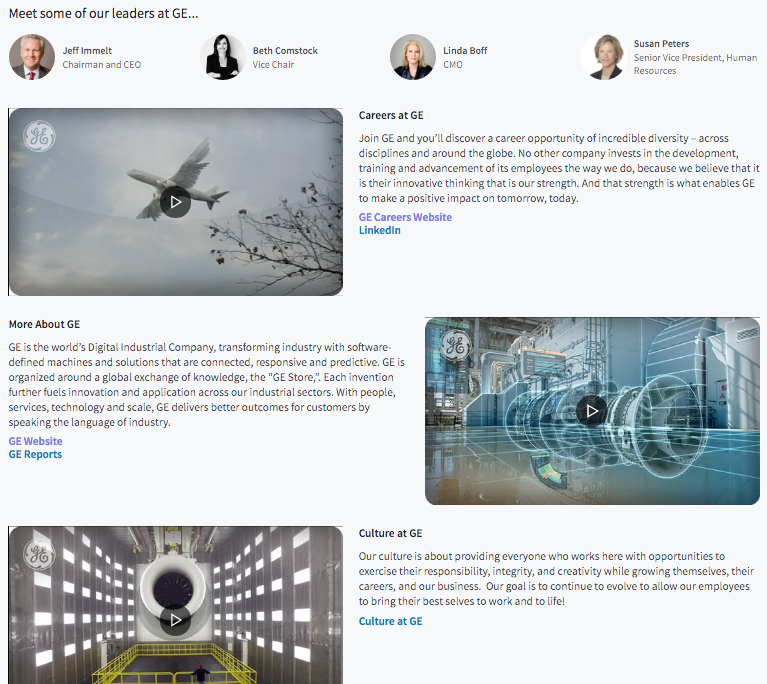 Sure, GE’s leaders have complete LinkedIn profiles. Beth Comstock is one of its “influencers.” But, how many other companies have senior execs who have LinkedIn profiles worth perusing? I’ve researched this before–I can tell you the number isn’t that high. So, this is an area of “opportunity” for many, many brands. Start working with your senior-level execs now! I also love the ability to add more detailed content around “About” and “Culture” sections right on the page. The opportunity to add more videos is HUGE! This is all great, useful information job seekers will undoubtedly be reviewing when making hiring decisions. The “Culture” section is new–so this is an area where you might want to think about what content you’ll add there now, rather than later. If you keep scrolling down in the “Life” tab, you’ll then see a section titled “Employee Perspectives.” This section aggregates LinkedIn posts from any employees who may have used the LinkedIn Publishing feature in the not-so-distant past (I’m speculating here–hopefully, LinkedIn will give us the opportunity to highlight the employee posts we want to highlight here). But here’s the key for brands: You need content published by employees to highlight! Again, GE has this content because it’s leaders have been at this for a while. Other companies can’t say the same thing. I’ve been highlighting LinkedIn Publishing as an untapped resources for leaders for more than a year now–finally, it now has an official spot on the company page. 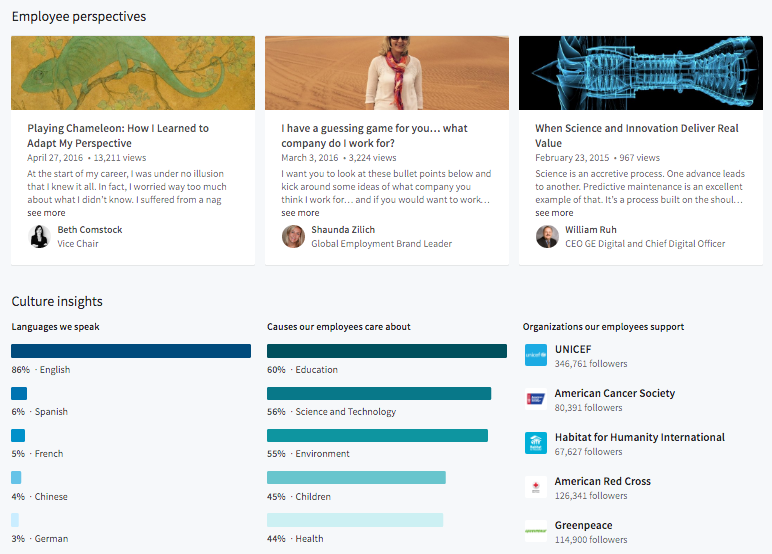 Finally, the “Life” tab gives us even more useful info right at the bottom in “Languages we speak”, “Causes our employees care about” and “Organizations our employees support.” Most likely automated info, but I’m also hoping LinkedIn offers companies some options here. For example, “Languages we speak” is relevant for GE since they operate and hire around the world. That same section might not be as relevant to a company based in Montana that operates in just 20 states.